According to a study in facial recognition, white babies aged just nine-months-old show signs of racial bias. Researchers at the University of Massachusetts in Amherst found that by the young age the babies were already discriminating against those of different races in their ability to recognize faces and emotional expressions. They analyzed 48 Caucasian babies with little to no experience of African-American or black individuals. Split into a group of five-months-olds and another of babies aged nine months, they were tasked with differentiating between faces of their people within own race and then of those belonged to another, unfamiliar, race. 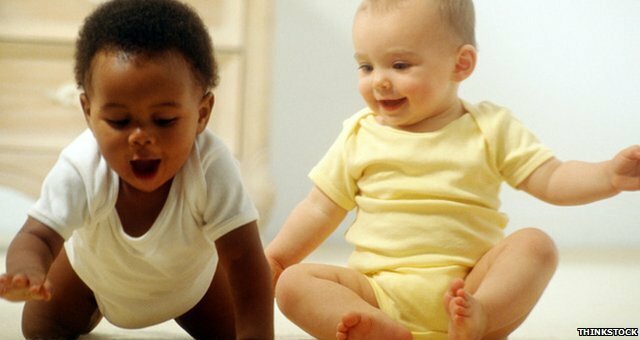 Babies from the five-month-old group were far more adept at distinguishing faces from different races, while the nine-month-olds were able to tell apart two faces within their own race with greater ease. In a second experiment the babies’ brain activity was detected using sensors. They were shown images of faces of Caucasian or African-American races expressing emotions that either matched or did not match sounds they heard, such as laughing and crying. Brain-activity measurements showed the nine-month-olds processed emotional expressions among Caucasian faces differently than those of African-American faces, while the 5-month-olds did not. The shift in recognition ability was not a cultural thing, rather a result of physical development. Researchers found that the processing of facial emotions moved from the front of the brain to regions in the back of the brain in the older age group. “These results suggest that biases in face recognition and perception begin in preverbal infants, well before concepts about race are formed,” said study leader Lisa Scott in a statement. This is similar to how babies learn language, medicalxpress.com reported. Early in infancy babies do not know yet which sounds are meaningful in their native language, so they treat all sounds similarly. As they learn the language spoken around them, their ability to tell apart sounds within other languages declines and their ability to differentiate sounds within their native language improves. The results further earlier research which found that adults have more difficulty recognizing faces that belong to people of another race, indicating that the disparity begins sooner than previously realized. The report is published in the May issue of the journal Development Science.